If for any reason you are not satisfied with the results of this product, just return the half used jar & the receipt to the place of purchase for a FULL AND COMPLETE REFUND. Peace, Many Thanks, & Many Blessings. For your night stand, dresser, medicine cabinet, bathtub, bedside table, you will find that the original 4-oz size is the best value in this amazing skin cream. 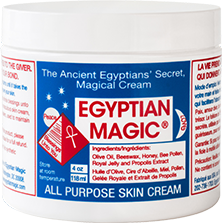 This is the best option for individuals with particular skin care problems and for larger families to ensure they always have Egyptian Magic on hand, based on feedback from our customers. 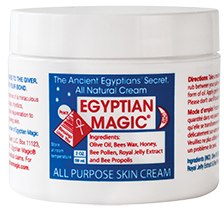 We will send you a jar now and we will automatically ship a new jar of Egyptian Magic to you every five weeks! This is the best option for individuals and small families to ensure they always have Egyptian Magic on hand, based on feedback from our customers. We will send you a jar now, and we will automatically ship a new jar of Egyptian Magic to you every two months!